Thank you to the artists, donors, volunteers, and staff. Works may be previewed from 5:30 to 7:00 pm the day of the event or one week prior to April 14 by visiting the gallery. – Gallery hours: Mon 9am-5pm, Tue-Fri 9am-6pm, Sat 10am-5pm. – Plenty of free parking available. Gallery entrance is at the rear of 88 Advance Road. The event is free of charge. Registration at the door or in advance. To register in advance, complete the Online Registration form below. Online registration will be open until Tuesday, April 12. 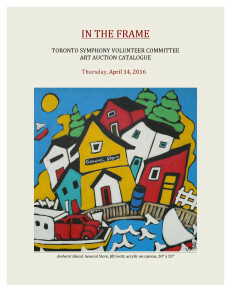 In The Frame is your opportunity to purchase at auction, unique works of art by renowned Canadian artists. These artists have had their work featured in prestigious collections both private and corporate. Only HST will be applied to the hammer price. There is no buyer’s premium. “When buying from an artist/maker, you are buying more than on object/painting. You are buying hundreds of hours in failure and experimentation. You are buying days, weeks and months of frustration and moments of PURE JOY. YOU ARE not just buying a thing. You are buying a piece of heart, part of a soul, a moment of someone’s life. Most importantly, you are buying the artist’ time to do something they are passionate about.” (The Arabella Magazine). Funds raised will support tuition-free enrollment for members of the Toronto Symphony Youth Orchestra (TSYO). The TSYO is one of Canada’s largest youth orchestras, and for more than 40 years has been dedicated to providing a high-level orchestral experience for talented young people aged 22 and under. 2015-2016 marks the first season that the TSO will offer tuition-free enrollment to all TSYO members on a scholarship. There is no charge to register for the auction. The Toronto Symphony Volunteer Committee thanks the Westmount Gallery and the artists for their generosity and support of this auction. The Westmount Gallery is celebrating its 40th anniversary this year. The owner, Judy Smith, is a strong supporter of the arts in general and Canadian artists in particular.